Under many layers of newer flooring we found the original pine floorboards, mostly in pretty good shape, but a lot of old paint, some sort of wash in other areas, and many boards are slightly crowned. We want to use tung oil to finish and have read a lot of stuff with great before and after photos... but nobody is talking about how they got the old paint off before they did the actual tung oil, or wax, or whatever. I have read that 150 grit sandpaper is the thing but then I also read about using chemicals. So as a newbie to old floors, little grasshopper seeks wisdom from the master on surface preparation. I have read a lot of good advice here and appreciate your generous sharing of knowledge. Hi and thank you so much for your help! You can't see it well in the pics but the boards are all tongue and groove. 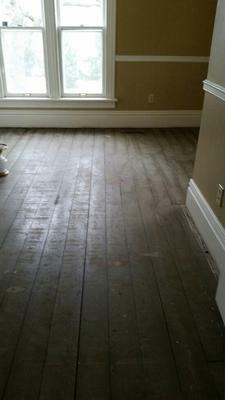 Indeed the floors, and the house, have lots of character and history... The original family that built the house were descendants of people who came over on the Mayflower, and they later sold the farm to a guy who was a famous gangster...lots of stories there! It looks like he was the one who had another oak floor, narrow and thin strips, put over the original boards with a gazillion nails. We dated that to the early 1940s. Later over both those floors was particle board and plywood and padding and carpet. So we took out each layer to discover what was underneath until we got back to the original. Will the TSP help get rid of stains? 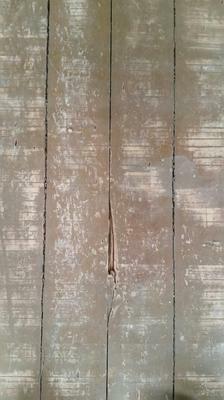 We are certainly willing to embrace the character and nicks and nail holes that won't go away with sanding but would like to improve the look as far as how clean the boards appear. Now, that is flooring with a story! 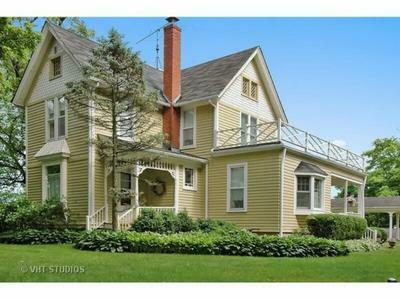 I can really appreciate your desire to return this lovely house to something more original. From what I can see from the photos, (and thank you for sending them,) the floor boards you wish to prep were not originally intended to be anything other than a nailing surface for the flooring to go over it. I call it decking because of its girth and because there doesn't appear to be any joinery between the boards. This decking always needs some TLC, which you are willing to provide, but I am stumped as to how you can get the paint out of all those nooks and crannies without compromising the wood, in some way.You really do not want to exacerbate the fracturing and splintering by grinding the bejeebers out of the boards to a new, thinner dimensional thickness. Are you ok with leaving the paint and patina, as is? If so, I might suggest a thorough hands and knees scrubbing with tri-sodium phospate, then letting it dry, completely, then applying the tung oil. And, when I say tung oil, I do mean the oldest recipe you can find. My favorite is original recipe Waterlox. You will find that the first two coats of tung oil will pretty much disappear into the wood. It is just that thirsty. You will probably need to apply at least two more coats, after that. The 150 grit sandpaper can be used in between coats for smoothness, but I certainly wouldn't try using 150 grit sandpaper for any other purpose in your refinishing process. I am optimistic that the high level of solvents in the original recipe tung oil will win over any potential contaminants that persist in the wood. One last note. 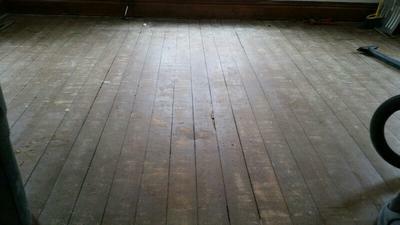 Given the size of the cracks between the floor boards, and given the cost of tung oil, it would be my strong recommendation that you pour your tung oil into a 5 gallon bucket and dip your applicator to apply the finish, as opposed to pouring it directly on the floor and then smoothing it out.